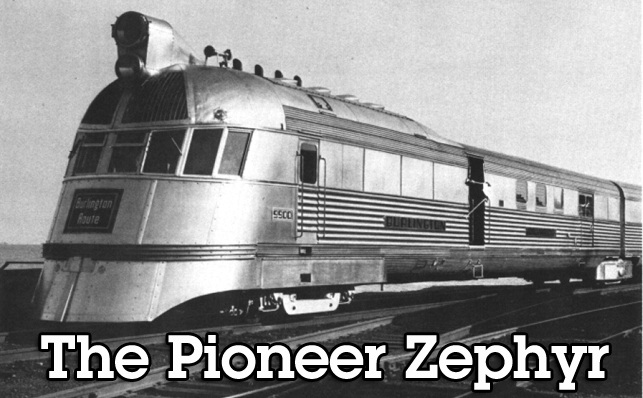 The debut in 1934 of the Pioneer Zephyr was one of the turning points in railroad travel. For underneath the Zephyr’s brilliant silver exterior lay a revolutionary two-cycle diesel engine that would soon replace the traditional steam engine, changing forever the nature of the entire railroading industry. The 97½-ton train itself was an impressive 196 feet of fluted, stainless steel, a lightweight material never before used in the construction of railcars. Not only was the steel beautiful to look at, it also held together better and wore longer than the metals it replaced. Inside the train, the Zephyr provided luxury accommodations today’s rail travellers can only dream about. With all those advantages backing it up, the Pioneer Zephyr salvaged the role of the railroad as a carrier of passengers, as well as freight. In the coming years, the powerful diesel engines introduced by the Zephyr would prove a formidable match to the burgeoning trucking industry that threatened to take away the railroads’ freight traffic. In 1934, the year the Zephyr made its first run, some 50,000 smoke-belching steam locomotives were puffing their way back and forth across the United States, racking up 17.8-billion passenger miles and 268-billion ton-miles of rail transportation. By 1961, following the Pioneer Zephyr’s lead, the country had become completely “dieselized.” Approximately 28,500 diesel units produced 20-billion passenger miles and 565-billion ton-miles. In other words, the diesel-powered units were capable of doing almost four times the work performed by their predecessors, the steam locomotives. But in the early days, the advantages of the dieselized engine were not so evident. Anyone watching a 1920 Model T automobile jerking and backfiring down the road would find it hard to believe that the object of so much derision would one day threaten the very existence of the railroad as a passenger carrier. But that is exactly what happened. In 1924, the Burlington Railroad carried a whopping 18 million passengers. Only five years later, as the automobile’s popularity increased, that figure dropped to 13.8 million. And by 1933, in the midst of the Great Depression, only 7-million travellers rode the rails. Passenger revenues followed a parallel descent. To the amazement of many, the railroad, with a tradition as grand as any in America, was slowly being replaced by an army of 30 mph automobiles. Luckily for the railroad industry and the travelling public, a figure appeared on the scene in the early 1930s, with the know-how and determination to build a train to meet the demands of the 20th century traveller. His name was Ralph Budd, and he became president of the Burlington Railroad in 1932. Budd reasoned that since automobile engineers had derailed the passenger train, they could be the ones to put it back on the tracks. As author David Morgan noted in “Diesels West!,” such thinking implied the use of a kind of automotive internal combustion power instead of the steam locomotive, upon which the industry had relied for a century. One of Budd’s first moves was to visit the Edward G. Budd (no relation) Manufacturing Co. in Philadelphia. The Budd Co. had been the first to produce the all-steel automobile wheel, as well as the all-steel automobile body. Now it was ready to tackle passenger train construction. At the Budd Co. plant, the Burlington president examined a test railcar body incorporating a number of radical innovations, including a gas engine and rubber tyres. Budd immediately dismissed these alterations as impractical. What caught his attention was the car’s stainless steel construction. The benefits of the stainless steel railcar were obvious: the material was lightweight yet strong, and it lasted almost forever. The problem was nobody had been able to figure out a way to build stainless steel railcars in a practical shop operation. Fortunately, the Burlington president’s timing was just right. The Budd Co. had just patented its newly devised “Shotweld Process.” The system allowed rivetless seams of stainless steel to be joined without damaging its corrosion resistant qualities. At the same time, it provided a joint stronger than the steel it held together. Ralph Budd knew a good product when he saw one. He decided this would be the material for the new train he set out to build to recapture the rail passenger market. On June 17, 1933, barely a year since he first stepped into office, Ralph Budd signed a contract with the Budd Co. to construct a train out of stainless steel. The firm was given virtually free reign in the design of the train. Now Budd needed a power unit for his stainless steel train, to replace the hopelessly outdated steam engine. As usual, Budd got what he wanted. The expertise of no less than three firms was brought to bear on the problem of building a two-cycle diesel engine to meet the demands for train engines with increased horsepower. The work was led by the General Motors Co., which was greatly aided by the company’s 1930 acquisition of the Winton Engine Co. and railcar builder Electro-Motive Co. But it was Charles F. Kettering, General Motors’ vice president of research, and the engineering staff of Winton Engine Co., that led the project to a successful conclusion. In the late 1920s, Kettering began work on the two-cycle diesel engine, which eventually would become an integral part o f the Pioneer Zephyr. His aim was to design a lightweight power unit with improved response and lower cost per horsepower than the available engines. A period of great productivity followed the 1930 merging of the General Motors, Winton-Engine, and Electro-Motive companies. During that time, a number of significant engineering contributions were made. The unit injector was devised, incorporating the pumping and fuel metering functions into a single device to avoid high pressure lines. Two other significant achievements were the application of the engine-driven positive displacement blower for scavenging, and the development of the welded steel crankcase, which enabled a reduction in overall weight over cast steel versions. While visiting the Fair, Ralph Budd came upon the display, and immediately decided that the Iight-weight diesel engine would provide the power for his all-new, all-important passenger train. As Budd saw it, the diesel railroad was the railroad of the future—and if any company could put the diesel engine in a train, it was General Motors. Approximately one year later, on May 26, 1934, the Pioneer Zephyr No. 9900 made its grand debut with a record-setting 1,000-mile dawn-to-dusk run from Denver t o Chicago in 13 hours. Appropriately enough, the Zephyr was named after the Greek god of the west winds. The train was powered by a Winton 8-201A 600-hp, two-cycle diesel engine (a revision of the model Ralph Budd saw at the fair), designed to travel at speeds of approximately 110 mph. Not only was the Pioneer Zephyr faster and lighter than its predecessors, it also reduced the Burlington’s cost of passenger train operation. A new era in railroading history had begun. The high operating standards of the world’s first high speed diesel-propelled, stainless steel three-car train were matched by the Zephyr’s painstaking interior furnishings. The first car held the diesel engine, engineer’s cab, a 30-ft. railway post office, and space for baggage. The second car carried a larger baggage compartment, a buffet grill and, at the rear portion of the unit, a 16-ft. smoking section with seats for 20 passengers. Third and last was a 31-ft. compartment with seats for 40 persons, and a solarium-lounge with chairs for 12. Prior to the Pioneer Zephyr, the travelling public knew only ornate but gloomy railroad car interiors. All that changed with the high-stepping Zephyr. Each individual compartment had a distinctive colour harmony coordinating wall colours, window drapes, upholstery, and floor covering. Following the Zephyr’s first historic run, it made another cross-country tour covering 222 cities, where it was received by some 2-million spectators. The train also was a hit attraction at Chicago’s 1934 Century of Progress. On Armistice Day 1934, the Zephyr went into regular passenger service, serving the West and Midwest until its retirement. That was only the beginning— for the diesel and for the Pioneer Zephyr. The train was the star of radio programs and a hit movie entitled “The Silver Streak.” It sparked dreams of adventure in the minds of countless small boys and girls—and of distant places in the minds of their parents. The first million miles of the Pioneer Zephyr were celebrated on Dec. 29, 1939. On Apr. 10, 1944, the Zephyr was the guest of honour at its 10th birthday party at Lincoln, Neb. The granddaddy of diesel-powered streamlined trains celebrated its 20th anniversary of regular service at Quincy, III. Finally on May 26, 1960, the Pioneer Zephyr pulled up to its final destination just outside the East Pavilion of Chicago’s Museum of Science and Industry, blowing the whistle on an unparalleled career that had spanned 26 years and some 3.2 million miles. *The Pioneer Zephyr is an American Society of Mechanical Engineers (ASME) International Historic Engineering Landmark. The text of this story appears by agreement of the ASME. Go to http://www.asme.org/Communities/History/Landmarks/Pioneer_Zephyr_1934.cfm for more on this Landmark.